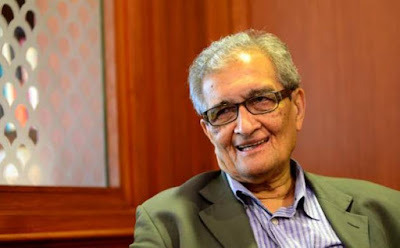 Acclaimed Indian economist Jagdish M Bhagwati lashed out at Amartya Sen again for his stand on Prime Minister Narendra Modi's demonetisation, reports FirstPost. Sen had earlier questioned the government's move of demonetisation and asked whether it was democratic or not. Replying to Sen's query, Bhagwati claimed that the former rushed in to say that demonetisation was undemocratic. “The answer is…it (demonetisation) was a democratic move. There were some people, may be I shouldn't say this, like Prof Sen rushed in to say it was undemocratic and…(pauses). I was not a fool (to say what I did to support demonetisation) I mean…and rush in and talk without consulting 10 other people. I mean, you make a fool of yourself (if you speak without speaking to public finance experts) like he did!" Bhagwati told the Firstpost. "When a (bank) note says, 'I promise to pay the bearer hundred rupees,' and you take it to a bank, he (the teller) will give you another 100 rupee note. There's no obligation to give you gold or silver or something! So, you have to be rather stupid to be rushing in with comments like that, you know…!” he added. In March, Bhagwati had criticised Sen in email interview granted to PTI, where he said that the Prime Minister's success in Uttar Pradesh indicated that "Amartya Sen and his friends who argued that demonetisation would hurt growth, have been humiliated and exposed as much as the Congress". Bhagwati was present at Arun Jaitley's lecture at Columbia School of International and Public Affairs (SIPA) on Tuesday where he questioned whether Aadhaar has paid enough heed to privacy. In response, Jaitley said that the evolution of privacy as also its exceptions has "satisfied me fully," the professor told the paper.